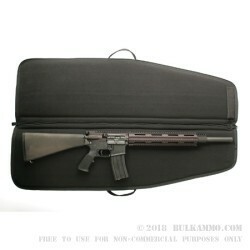 A perfect size for the tactical semi-auto rifles like the AR-15 with the 42.5 inch overall case length – this is a versatile and good looking range rifle bag. For the money you will have a hard time finding a better equipped bag for general transport duties and range use. The overall build quality is seriously good, and the creature comfort details are very intuitive and useful. The padding is adequate for normal daily use and can stand up to normal wear and tear for years. The soft interior lining and the included padding gives your expensive rifle a safe place to hang out when they aren’t in the security of your safe. BLACKHAWK! Offers top quality equipment that has a durability that other brands at the same price point cannot compete with. Top tier zippers and an easy to use, open architecture in this case means you are getting something that fits just about any gun in the size range without drama or pressure on the zippers. Five magazine pouch style stash spots offer good storage for your pre-loaded magazines (make sure you understand your state and local transport laws before you travel with ammunition and rifle together. Fantastic Buy!! Fantastic Case!! Fantastic Shipping!! Fantastic Company!!! Outstanding Value!!!! Next time it comes on sale, I'm buying 6 more!!! Fantastic price, excellent product, and the shipping was faster than advertised! 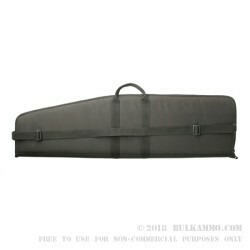 Bulk Ammo hit a home run with this bag. I bought two and love them. Lots of storage and a very well made bag. You dont get too many bargans these days, but this is a top notch bargan. I received it the next day witch was great too! 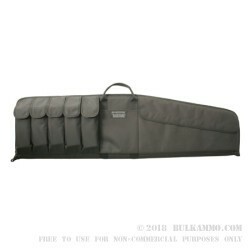 Great crew at Bulkammo.com, super fast shipping, great products and prices! Quickest Shipping Ever!!!!! The Bag is Awesome!!!!! I bought six and I think it was worth every penny, shipping was super fast, received in just a few days. Not many great deals come along for us during this crazy time. This is one to jump on and buy more than one. Product was what I expected and is perfect for what I needed. Service was amazing, even in these times of panic buying. Q: My rifle is exactly 42.5. Take it, it wouldn't fit? A: You should be good to go with this case if you have an average AK-47. Generally, those rifles are around 36-inches in length so you should have a little bit of wiggle room. Of course, different barrel lengths can lead to longer firearms that might not fit so it will depend upon your specific firearm. The case itself is 42.5-inches long so you may want to take a tape measure to your rifle if you have it in-hand. Hopefully that helps, if not--- please just let us know!